Last year's climb of Mt. Julius Caesar required, for me, this follow-up, scheduled climb to do the remaining two SPS listed peaks here. This was another two-day weekend trip. Only two others joined me for this fairly strenuous adventure. I didn't need to drive for this one, thanks to Chris and his VW van. We drove into Bishop for breakfast. Starting again at the Pine Creek Trailhead, the air from the mining operation wasn't as bad this time. We quickly backpacked up the dirt road, reached the trail, and camped in the general vicinity of Honeymoon Lake again. We had made good time, so sought to do something. Having the whole afternoon, we chose to scout about. 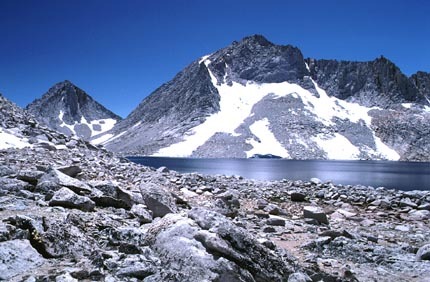 We gained the sight (photo right) of our major peak goals from the Royce Lakes approach saddle. The solid granite rock makes for an interesting view beyond the dark blue lake. There was an unnamed peak, VABM 12,563', right above our base camp. The guide mentions the ease of this peak, technically. We scrambled around to its hikable side on the west, then did the couple thousand foot, class 2 climb to the summit area. There was a register, with good views. A huge block, seemingly teetering over a big drop-off, constituted the highpoint. Not having a rope, none of us attempted to bag this rock. This is in technical violation of my rules to always touch the highest point. But, it would have been an airy move to climb this, and risk the whole rock tipping over into infinity. The HPS rules say you don't have to do what you don't want to climb, to count an ascent. That rule is for wimps! But, we made an exception in this case. Even the climber with difficult class 5 experience didn't choose to boulder this one. This was not an important peak, and was one of the few, unnamed, big summits that I had ever (mostly) climbed. We downclimbed uneventfully, and enjoyed the great weather. This was the final trip that I would be making up from this trailhead, and this part of the High Sierra. I have no adverse recollection of the camping this night. We talked a bit, then retired into our bags for a long day tomorrow. There was an early morning photo op of the sunrise light on our most recent peak, with the moon. The overhanging summit block is apparent from camp. Dawnlight shone on the upper portion of the peak. Chris took pictures, as did I. On the move at 5 or 6 a.m., we hiked cross-country to Royce Lakes and chose to climb Merriam Peak first. It has a short, class 3 rock band just before the summit. Climbing first, though, to the saddle between the two peaks, we rested. This first peak, Merriam, wasn't any big problem. There were no surprises like on the previous day's climb. We topped out there in mid-morning. The weather was excellent. It's always a great pleasure to be able to really enjoy the High Sierra on a weekend. Photographically, the light was dull. Without clouds, there is no drama for me. My summit view photos were not very interesting. A view to the south is seen here (photo left). 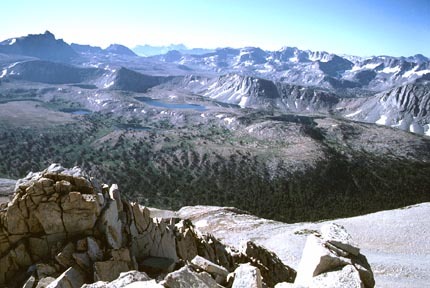 Many people come to the High Sierra for an entire week, as required on a Sierra Club National activity. They don't do as much backcountry travel as on most of our climbing weekends. Many of the base camp trips travel a relatively short distance to some lake, then hike from there or relax for the week. While fine for some, my style is to achieve. The programs of the peak sections fulfill this urge in a superb fashion. Signing in the register, we were shortly off for the next peak. Royce Peak is higher, but a class 1-2 sandy slog completes the route to the top. It amazes me how well we do on our climbing times to these high peaks. We enjoyed the view, and started down. We had a nice sand run down the slopes back to the peak saddle. I had the time to take pictures of some big yellow flowers known as alpine gold. These are a hardy species to survive up here, and through the winter. Scientists were amazed to find plants living deep in the ocean next to hot water vents. The current space exploration of Jupiter's moons attempt to determine if life is possible on Io and Europa. Well, if these delicate flowers can make it through a Sierra winter, I see how such scientists think. I got a picture of some red snow. We descended in the most routine fashion back to camp, packed up and hiked out. I usually allow people an hour, once back to camp, to get ready to go. If the weather is good, we don't set up tents, saving time. I have heard of trips where the leader announces, "Five minutes!" You have to rip up your tent, stakes and all, then stuff it all into your pack. Quick, or not much, thought is ordered by some to rapidly pack your pack! A fellow was bringing up a mule pack on the trail. We came back to the trailhead by 5 p.m. It meant a return time home of about midnight, which is standard. The Sunday restaurant dinner is a good time to tell stories and recollect the weekend. We are sore and stiff, but the coffee for the drive home helps immensely, for me. Back then, I had no problem with falling asleep when I got home, even after several cups! One of the climbers had to begin work that night on the graveyard shift. It must be rough, but he does it. His is a physical job, too. Others close their office doors, I hear, and order not to be disturbed. One climber has several ploys to sleep while pretending to read reports, or taking naps sitting on the toilet. This particular one does not hold a job for long, but his stories are funny. This all takes place in the Silicon Valley. I feel extremely fortunate not to ever fall asleep on the road. This is a prime danger for beginners. You must be extremely strong, with incredible endurance, to partake in these climbs. No wonder that not many sign up for these trips. It amuses me when the self-declared "great" climbers fall asleep quickly on my driving home. Instead of music on the radio, I have to listen to snores. Well, as a service to local mountaineering and travel for the local chapter of the Club, I maintained these events for six years. No one has ever done as well, or as much. I have heard of car crashes and general incompetence by others. I am proud of our record of nearly constant success, and safety. This was certainly the golden age of mountaineering for the local chapter, one that has never been repeated. All of the others pretty much relapsed to their regular lives after these events were terminated. I am the only one who actually still enjoys doing these climbs and long drives. I will continue to climb, although I am running out of peaks. This is the best sport that I have ever known for viewing natural, scenic, high alpine beauty, and getting great exercise in clean mountain air.